For years astronomers have been identifying planets around other stars by observing star wobbles created by Newton’s Third Law of Motion. Today the first direct images of extrasolar planets were released. 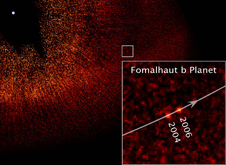 NASA showed a planet orbiting the star Fomalhaut, while the Gemini and Keck observatories released images of a three-planet system around star HR 8799.